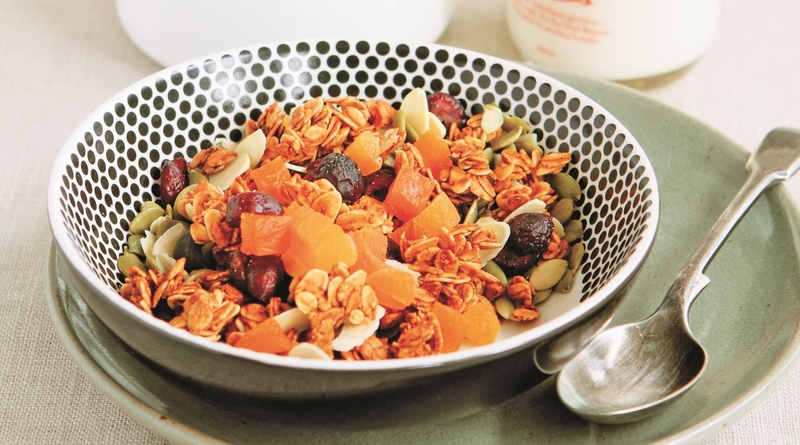 Granola is delicious and you can easily put it together for breakfast. This recipe was first published in Flavours magazine. Blend all the ingredients for the liquid mixture and mix with the oats. Spread mixture evenly in a single layer on baking trays. Bake in preheated oven with a fan at 130°C for 90 minutes; rotate the trays, gently turning the oats every 30 minutes so that they bake evenly, until dry and crisp. Cool before mixing with the seeds and nuts. Store in an airtight container. Just before serving, add in the dried fruits, then serve with milk or yoghurt, and fresh fruit.